05/02/2002: Neil was planned to guest at Yann Tiersen's gig at the Royal Festival Hall in London, but won't appear because of unforeseen technical problems. • After a test gig to fan-club members, The Divine Comedy, then reduced to Neil Hannon, Ivor Talbot and Rob Farrer, start a short tour in the States. 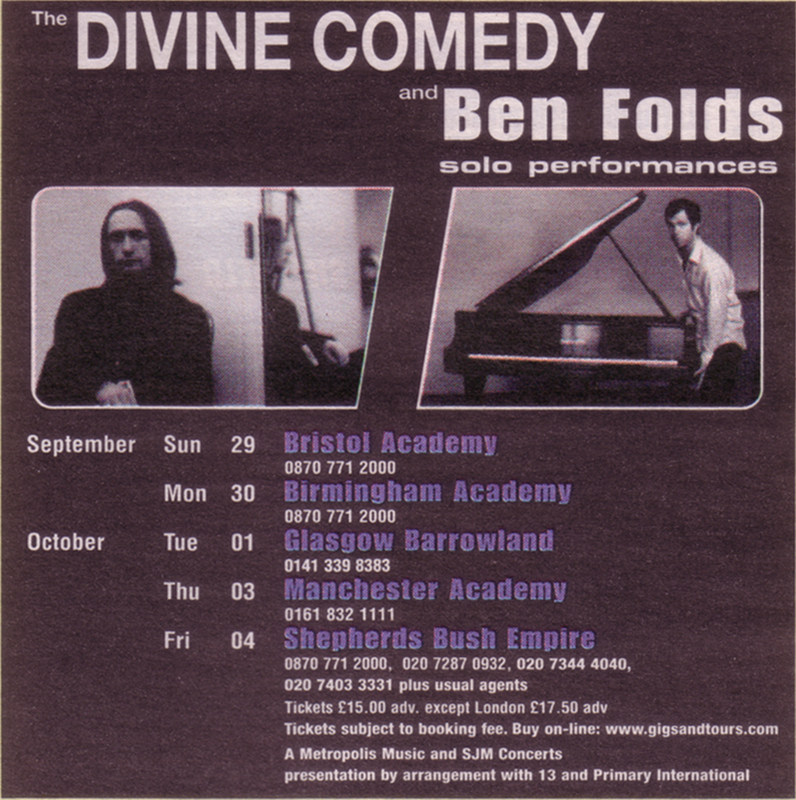 02/2002: Neil starts a U.S. solo tour supporting Ben Folds to promote Regeneration. 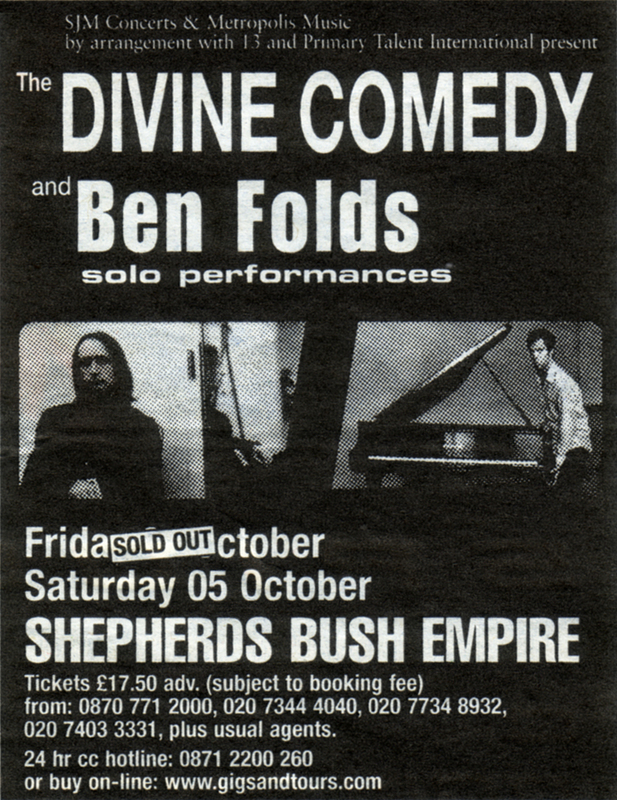 Neil and Ben Folds go in studio together in the States to make some rehearsals. 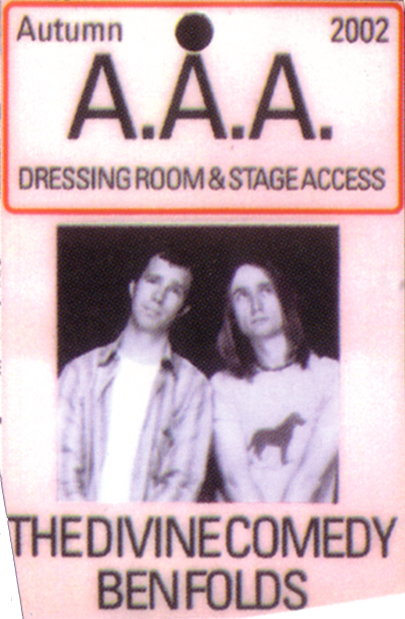 18/03/2002: In Boise, Neil Hannon writes the song 'Idaho', which he will perform a few day later. 26-27/04/2002 ? : Neil is shortlisted at the Hot Press Awards for the Best Songwriter Award, which he wins, but unfortunately he is not able to come as his wife is ill.
05/2002: After reflection during the US solo tour, Neil officially announces he will keep the name The Divine Comedy for his next album, on which he has already started working. He adds: "Neil Hannon is a sucky name for a pop-star." 05/2002: The Divine Comedy goes with Guy Massey in Konk Studios, London. The sessions include among others: 'The Wreck Of The Beautiful', 'Absent Friends', 'Idaho' and 'Absolute Power'. Part of these sessions will be used for the final recordings. 21/05/2002: Miggy, Pinkie and Rob play for a Raggae band called "The Full Hundread" at the Spitz in London. Pinkie has helped set up and establish the band. Rumours about the former Divine Comedy members say that they have cultivated some key contacts with the Jamaican music scene. 06/06/2002: In Buffalo, Neil Hannon starts writing the song 'The Happy Goth' that he will performs a few day later. 14/06/2002: Neil Hannon officially set up his own label, Divine Comedy Records Limited, which will buy back all his rights from Setanta in order to re-issue part of his discs as soon as 2005. • Simon Little joins the band as bass and double-bass player. • The Divine Comedy, now officially made of Neil Hannon, Ivor Talbot, Simon Little and Rob Farrer, tours the UK, accompanied by Ben Folds, but this time they play together. 10/2002: The Divine Comedy goes with Mark Wyllie in Intimate Studios, London. The sessions include among others: 'Mr. Right', 'Girl Least Likely', 'Our Mutual Friend' and 'Absolute Power'. Part of theses sessions will be used for the final recordings.